We are pleased to announce the two winners of the Beyond Remix Contest, The Synthetic Dream Foundation and Pulse State. 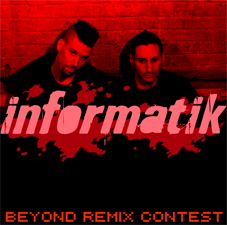 Both of their remixes will appear on our upcoming release Arena this fall 2009. In addition, 1st runner up Aimonia will appear on our limited edition tour CD. We have selected 13 tracks from the entries we received and have compiled them into a free digital release. This album is licensed under the Creative Commons Attribution Non-Commercial Share Alike License. You are free to share and pass on this album. Please click the cover image below to download. Enjoy!